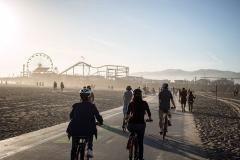 Enjoy an easy roll on a City bike with our guide who will show you the must see spots of Santa Monica and Venice Beach. Experience Santa Monica’s premiere shopping district and landmark neighborhoods to the city’s sweetest secrets. Just one block from the beautiful beaches of Santa Monica is the historic Main Street. Known for its eclectic collection of boutiques, cafes, restaurants and people, Main Street is a must-see local hangout on the Westside of Los Angeles. To the outsider’s eye, downtown Los Angeles is a bit of a mystery. Join us on a guided walking tour of downtown Los Angeles to get the insider’s look at this burgeoning city’s coolest districts and most innovative food establishments. 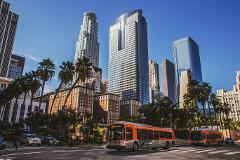 Get off the tourist path and explore authentic Downtown Los Angeles! With our expert local guides and electric bikes, you’ll cover more ground and experience more of the real LA in 2.5 hours than many visitors do in several days!